The ranking of a site in Google completely depends on the website copy. If a site is not properly executed then even the most advantageously planned site can be of no use. The role of SEO copywriting is to render content valuable, as readability of the viewers cannot be sacrificed. Importance of Keywords: The title of the article is one of the most important places where the keyword should be included. It plays a significant role in grabbing the reader’s attention at the very beginning. Your keyword should also be incorporated in the opening paragraph. The opening paragraph is an introduction to the content, so it should also be catchy to draw user interest. Keyword Stuffing: Over incorporating of keywords is called keyword stuffing. When you over use a keywords it leads to repetition, making the SEO copy boring for the readers. To avoid this error, you can read the content naturally to a human. This will help you hear any repetition in the copy. Add Links: Links play a major role in SEO. Good content should provide links for your site as people want to share content that is appropriate, well written and useful. You can increase your sites ranking by building links that are search engine optimized and are reader-friendly. Meta Tags: Meta tags have enormous ranking value. You can use your title’s keywords in the title. Through meta tags and meta description tags, the webmasters can have constant access to relevant data on your site. But repeating keywords in these tags can be considered spam. Structure of the Text: Well-structured content always catches the reader’s attention, as it makes it easy for them to read the whole content. Make sure that the copy is not too long and is broken into paragraphs and add subtitles. SEO copywriting is all about making your content not only readable but also persuading visitors to stay on your site, thereby resulting in better rankings and higher ROI. Advertising has broken its conservative moulds long ago and keeps doing that every single day. With the advent and flourish of outdoor advertising in the last decade, this has become one of the most appealing ways of wooing the customer. Marketers do not like to tip toe around the idea but take it full on, making the most remarkable statements through a few exemplary takes on outdoor advertising. Point of Interaction: For outdoor advertising, the point of interaction makes a lot of importance. There is no set formula, for the advertising may appear on a billboard, a local transport, a building or any unconventional space. However, the message should blend well with the space in question. 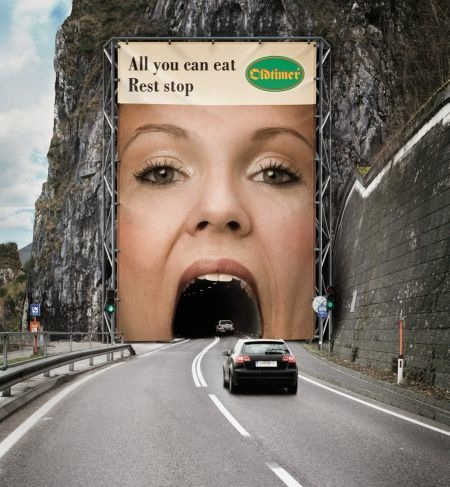 Creativity Factor: There is no argument that outdoor advertising allows for more creativity. Given that the space is not confined to an A4 size magazine sheet or a 30 second commercial, this one gives plenty of opportunity to experiment. Attention All: It definitely gets all the attention. For the sheer reason that outdoor advertising takes on a bigger space and makes a larger than life statement in an open arena, it grabs the eyeball. In fact, it becomes as unavoidable as the online pop up ads. So, one is not going to miss out on these, while driving back home or even inside an elevator. Cost Play: This one works well for the advertising budget. Considering the exposure time and investment, deciding for an outdoor display of product or service idea is a cost effective deal. Long Stay: Outdoor advertising makes for a perfect setting for a theme based campaign, run in series. People are more mobile and it is more likely that they come across the advertising while on the move, thus, giving the campaign the much needed exposure while it makes for a longer impact. Delivering a product message has never been as competitive as in the present-day context. So, how can a brand really stand out? How can it truly create an impact? How much should the brand spend? With a splurge in digital marketing as well, brands have a lot to experiment with, when it comes to creating a unique space for themselves! Google has always encouraged and even spearheaded innovation. In 1998, Google started a new phenomenon with a series of doodles. The first doodle honoured the “Burning Man Festival” and as the years followed, the phenomenon picked up pace and got more creative and funkier. Let’s take a look at the most interesting doodles of 2012. 1. Hisashige Tanaka’s 213th Birthday: To honour the great Japanese inventor, Google created quite an intuitive doodle with flash animation. As Hisashige Tanaka created the Karakuri dolls, Google also created a doodle which portrayed the mechanical prowess of his inventions. 2. 107th Anniversary of Little Nemo in Slumberland: This is probably one of the most elaborate doodles Google has ever created. This doodle honoured master draftsman Winsor McCay who was one of the most remarkably talented storytellers the world has ever seen. The doodle consisted of a series of animated sketches which told an interesting story about the adventure of a boy. 3. Robert Moog’s 78th Birthday: How could Google ignore one of the finest creations gifted to the world by Dr. Robert Moog. As a token of gratitude to Bob Moog’s unique inventions, the Google Doodle created a close version of the keyboard, consistent with the theme of 1960s music. 4. Julia Child’s 100th Birthday: For the love of Julia Child, Google Doodle celebrated her birthday with a Google Doodle. Celebrating in the honour of someone who has been an ardent supporter of causes close to her heart was a small yet significant tribute. 5. Howard Carter’s 138th Birthday: It was the most FUN Google Doodle ever. Some may say that it had a kind of dizzying effect; nonetheless, it was addictive. Intricately detailed, this doodle also ranks as one of the best of 2012. Now, Google creates doodles to honour major festivals of the year, known personalities and various other things. With its doodles, Google has given its followers an extra something to look forward to. It is not difficult to build a blog, but at the same time it is difficult to build a successful blog with traffic. Blogging is like an art through which you can share your thoughts, interests and knowledge with the world. Successful blogging can only be achieved with hard work and dedication and through this you can drive thousands of visitors to your site. So, here are some effective tips to increase traffic to your blog. Write Often and Write Well: You must update your blog with useful content frequently, so that you can attract visitors. Make sure that you think like a consumer and let your voice be heard with meaningful facts to maintain the consumers interests and gain loyalty from them. SEO Friendly Content Many bloggers tend to ignore this channel because of a variety of reasons, but search engines give an enormous opportunity for traffic. Setting up SEO for blogs is very simple, if you are using an SEO-friendly platform. You can make your page or you’re website more relevant to search engines. If your page or website ranks the highest in search engines, then it will be viewed by larger number of viewers. The use of relevant keywords can also make your content SEO friendly. Use Social Media and Q&A Websites: One of the easiest ways to increase blog traffic is social media. You can make public profiles on popular networking sites, such as Facebook, Twitter, Google+ etc to build a fan base for your blog. Sharing your blog posts will help you increase traffic. Getting active on Q&A sites by reacting to comments and providing your website link as a source can also help you increase blog traffic. Get Interactive: You must also react to the comments left on your blog by giving the readers your opinion about a particular topic. Commenting on other blogs is also helpful, but don’t forget to leave your URL to create a link back to your own blog. However, always make sure that you leave meaningful comments. Whilst the success of a blog hugely depends on how it is shared and promoted, unless you have quality blog content, all of those efforts may go in vain! An infomercial is certainly a departure from a standard advertisement or commercial. In that regard, it gives immense importance to the product to extend the feature up to 30 minutes of television time. The viewers get a detailed description of the product with useful inputs and testimonials from early users. 1. Need: Need is an important element that should be understood way before one decides to launch the product for users. If there is a hidden need for a certain product in the market, then, half the job is done. The consumer having realized the importance of the product would sure respond to the infomercial. 2. Value: For any infomercial, the value of the product should be reinstated time and again during the whole time frame. The consumer should find the product to be economical in terms of usage, benefits and money. 3. Uniqueness: The unique element of the product will become the highlight of the information. Everything else takes the back seat because this feature is not to be missed. It will be one aspect that would compel the prospective user to think about it as it cannot be found in any other product. 4. Offer A certain discount on the product is always appreciated. This puts the consumer in a comfortable zone and in fact gives him a sense of joy as he gets to save on the expenditure. A seasonal discount or percentage off is a must. 5. Emotional Connect: Last but not the least, an emotional connect with the audience can be built. This can be done by the help of testimonials where other users give an account of how the product helped them. Once the credibility is established with the stories, the product is accepted. It would be a defying act but it is true. The very fact that niche means something attached to somebody’s specific preference may now be encroached upon by a different space altogether. Marketers and advertisers have realised this phenomenon early on and have clearly taken heed of that. Niche advertising is meant for products or services for a very segregated section of the population and at times it may take into account factors like lifestyle, spending habits, income group etc. Coming to that, what has recently been noticed is that niche advertising is making a bigger appeal to the audience in general. It is well known that advertising plays upon the hidden psychology of emotion. This clearly gives niche products a different standing. People more often than not start associating niche products as something special and thus, getting attracted towards it is natural. Ferrero Rocher chocolates would be a humble example here. Niche services are already positioned as something desirable in the market, be it exclusive bone china or a SUV. The play is that the ones who can afford it would have to have it and the ones who are still undecided, will be pushed towards it. Sometimes a ‘limited edition’ tag makes it all the more necessary to be acquired. It is not so easy to notice but it is there with all individuals. The psychology of association with a group or variety of individuals with similar taste, representing particular lifestyle is quite common. This is another strong reason of how niche advertising gets to a wider network of people because there are a good number of these association seekers who like to buy, wear, use and flaunt products to get attached to the group. While some of the above arguments are not being discovered on the surface but they are valid and work huge favours for the marketers. Niche advertising has never been as popular as it is now. It is certainly serving out a bigger purpose than is intended or rather moulded so to do that instead. Today the world is revolving around the internet. And if you have no clue about how to promote your business, then LinkedIn proves to be the best professional tool. LinkedIn is a lot like Facebook but this networking site has a professional bend. It is a great site for are looking for work and are trying to build a professional network to expand their business. Though LinkedIn has gained popularity, a number of business owners avoid their company pages on this site. It is still somewhat new for people. So, understand the dynamics and get started to advertise your business online with a few tips and tricks to promote your company. Introduce your Business: Introduce your business by creating a company profile, so that others can subscribe to it. This page will include a description of your business, the services you offer, know-how and contact information so that others can easily reach out to you. Creating a company profile proves to be very important as it will give the clients an information about the services you offer. Subscribe to Groups: Joining groups that are related to your business and actively participating in discussions, giving feedbacks can help in advertising your business. You can subscribe to maximum 40 groups. Talk about your work and update posts which can interest the customers and clients. Track Public Reviews & Give Instant Response: Linked In Buzz gives you a chance to track public reviews about the company. In case of any negative comments, you can instantly respond through this service and resolve any bad review. Answering questions on the LinkedIn forum is another way of gaining popularity thereby helping you in generating clients and escalating your credit ability. Post Vacancies: LinkedIn helps in hiring the most suitable person for your company. Hiring is a great sign of positive growth of the company and creates a positive image about your business growth. Reach out to your Targeted Audience: Worried about marketing your business? LinkedIn DirectAds provides you with a solution. It is an excellent marketing tool to reach out to your targeted audience globally and create a positive image of your business. All Linked In Users longing to become business icons take a look at these different aspects and utilize the endless benefits of LinkedIn. For consultation on this and other aspects of digital marketing, talk right to the experts. Customer loyalty is something which can only garnered by sustaining an effective interaction between the brand and the customer. Social media, being the increasingly popular tool for socialising, has reinvented the dynamics of human communication. Thus, social media presents a unique opportunity to marketers to establish a connection with their customers and earn their loyalty. Real Time Connect: Just like people use the social media to maintain an uninterrupted contact with their friends and family, brands can also do the same with their customers with the help of social media. Social media lends an outlet to organizations for updating customers about the latest offers, discounts and promotions on a real time basis. An Extra Ear: Social Media lets the brands listen what the customers are talking about them. Brands can improve on their products or services with the help of the feedback garnered through social media. Redressal: With the help of social media any negative feedback from the customers can be readily addressed and resolved. Grievance redressal is among the key tenets of brand loyalty. Rewards: Rewarding the customer naturally contributes towards the increasing the customer loyalty. Rewarding people through social media triggers a chain reaction which gives wider exposure to the brand and enhances its fan base. Enhance Transparency: With social media, customers can know the brand much better. A brand can promote its purpose and ideology in a better to its key demographics. The customer can certainly get more involved with the brand with the help of social media. Brand Awareness: You cannot expect to build brand loyalty until and unless your customers are aware of your brand. With the help of promotions of social media, you can make your brand the centre of attention for your target market. Social media enables brands to have a casual dialogue with their customers and establish an understanding with them. This understanding ultimately contributes towards the establishment of loyalty with the end customer. This makes it imperative for every brand to have a unique social media strategy in place.